One thing that is on everyone’s bucket list: a road trip through the West Coast of USA. There is nothing more wonderful than cruising through breathtaking landscapes, wild nature, and cool cities and all that with the sunshine on your face. But planning a road trip requires some preparation. Because which places do you really need to see? What’s the best place to start your road trip? What are the highlights you can’t miss? And how long do you need to go? We had the same issue when we started planning and that’s why we decided to write this article. This post covers the ultimate road trip itinerary for 3 weeks, which is the perfect duration for a road trip in West USA, the places we’ve stayed and a route map. This itinerary will take you to the most incredible places like San Francisco, Yosemite, Death Valley, Las Vegas, Lake Powell, Monument Valley, Grand Canyon, and Los Angeles. Ready to go? San Francisco is the best! Wow, what a cool city. A city with inspiring cultures, vibrant neighborhoods and so many things to do. (discover the highlights here) You will not be bored for a minute! We recommend you to stay at least 3 nights. Do not miss a visit to Alcatraz and walk as much as possible. You will see so much more than when you would drive through the city. The Hop on Hop off bus is also quite fun, it takes you to all highlights in no time. You choose where you get on and off and how long you want to stay somewhere. We stayed at Galleria Park Hotel, a lovely boutique hotel located in the heart of downtown San Francisco’s Financial District. Yosemite makes you speechless. One of the most-visited parks for a reason. A place of extremes with a beautiful natural scenery, high mountains, waterfalls, sequoia trees and a paradise for hikers. Spend at least 2 days and stay as close as possible or even in the park! We would have liked to stay here for a few days longer. We stayed in The Monarch in Mariposa, which was about a 45 minutes drive to the park. Good option if you are on a budget, but next time we definitely would stay inside the gates of the park. 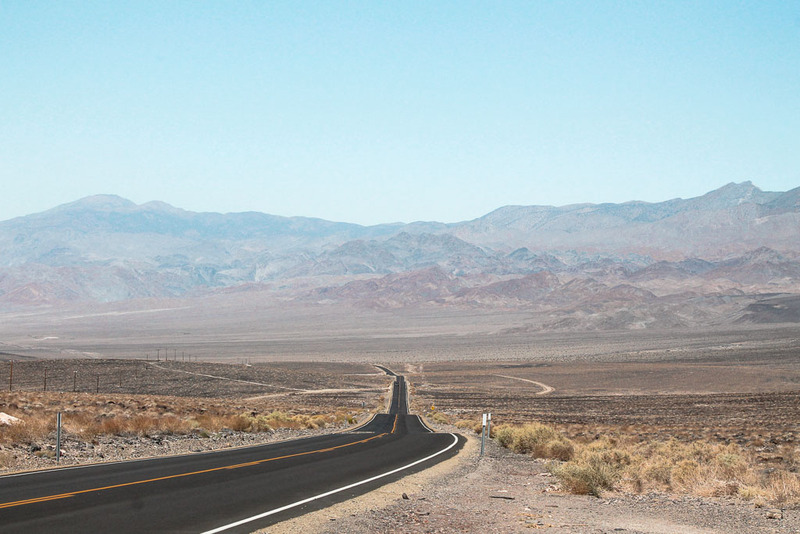 Death Valley with its salt plains, deep canyons and impressive landscapes you can’t skip. It is one of the hottest and driest places on earth and the lowest point in North America can be found here, about 85 meters below sea level: Badwater Basin. The Ranch at Death Valley has a superb location in the heart of the park, with a good swimming-pool (highly needed! ), a restaurant and a gift shop for your daily bottles of water. Zion National Park can be found in the state of Utah, which means 1-hour difference compared to Arizona and California. It is surrounded by forests and mountains, the landscapes here are very impressive, you can do great hiking here and the rock formations form a colorful backdrop. 1 day is way too short.. We could only do 2 short trails and were so sad we hadn’t more time. So if you can stay longer, definitely do it here! We stayed at Zion Mountain Ranch and we loved every minute! A beautiful ranch, at the east entrance of Zion National Park with breathtaking buffalo views. And their restaurant Buffalo Grill… Wow! The best steak we had in the US. Can’t wait to visit it again! Bryce Canyon National Park really is a photogenic park with its famous “hoodoos” and the place-to-be for the most beautiful sunrises and sunsets! You can perfectly visit it on one day and you have several trails that you can combine. The park a little bit looks like an immense amphitheater with beautiful rock formations. According to the others, one of the most beautiful parks in the West. Many people ask us which one we prefer the most but actually, we still can’t choose. They’re all so unique and beautiful in their own way. We chose to stay at Best Western Plus Ruby’s Inn for its good location near the park. Page is the perfect place to visit the many highlights in the area: Horseshoe Bend, Lake Powell, Glen Canyon Dam, and Antelope Canyon. We stayed one night, which was just too short to visit everything relaxed. Some tips: visit Horseshoe Bend during sunset, pre-book your tour for Antelope Canyon and have dinner at ‘Big John’s Texas BBQ’! This old gas station converted into a restaurant serves the most delicious pulled pork and a live music band will give you the ultimate country feeling. Yummy! We stayed at Quality Inn at Lake Powel, basic rooms but great location! Monument Valley is the most iconic landscapes of the American West. Located at the Arizona/Utah border, so keep 1-hour time difference in mind. (important if you have pre-booked a tour) With its desert landscape, phenomenal beauty and large red stone formations, it is by far one of the most phenomenal places on earth. You really feel like you’re in the middle of a western movie. Keep your camera ready and admire the real Wild Wild West around you! Kayenta Monument Valley Inn was a good location to stay over. Grand Canyon is one of the most famous and most visited attractions in the US, but may not be missed on your road trip. The Colorado River breaks this gigantic gap in two parts, namely the North Rim and the South Rim. Leave your car at one of the parking areas and jump into one of the free shuttle buses that operate in and around the South Rim. No tickets are required, and the stops are clearly marked by signs. No need to hike a lot, but of course you can hike different trails if you want to. For example, the ‘Bright Angel Trail’ that lets you descend into the Grand Canyon. From the various viewpoints, you can enjoy the most magical sunsets in the evening. We stayed at Red Feather Lodge, located just 1 mile from the South Entrance. I surprised Mik for our 10th anniversary with a helicopter ride. It was such a cool experience and a memory for a lifetime. We highly recommend Papillon Grand Helicopter to book your tour with. We took the North Canyon Eco Star tour and we both loved it! There are tons of reasons to visit Las Vegas. Most people come here for the world-famous casinos, the party atmosphere and even to get married. We took the time to relax at the pool of Tropicana Resort and enjoyed some sight-seeing and shopping. A road trip can be exhausting, yes! In the evening, we strolled along The Strip, with its neon billboards and saw the Bellagio fountains which were fun to see. The Venetian Hotel is also a great place for some good restaurants and entertainment. Palm Springs is the ideal stop just before you reach Los Angeles. In the middle of the desert, this insta-worthy place is home to many stars and legends and has some of the greatest restaurants in the world. Also known for its year-round sunshine (more than 360 days of sunshine per year) and Coachella Festival, this place is just lovely! Our stay at The Saguaro was the cherry on the cake! Wanna do something active? Joshua Tree National Park or the Aerial Tramway to the top of Mount San Jacinto are some good choices. Los Angeles or simply LA offers something for everyone. You have beautiful beaches like Venice Beach, the theme parks Universal Studios or Disney World, the famous Santa Monica Pier where you’ll find the end of Route 66, Hollywood Hills and the luxury villas of the most famous celebrities in Beverly Hills. You should spend at least 3 days here or possibly even longer if you can. Tip: Rent a bike in Venice Beach and drive down the Venice Beach Boardwalk to Santa Monica Pier. So nice! Boutique 444 Venice Beach is a beautiful apartment to stay in. Next to the Venice Canals and a 5-minute walk to the beach. Our road trip through the West Coast was definitely one of the coolest things we did! In one word: EPIC! Such a freedom and so impressed by Mother’s Nature every second. Wanna see more? Go check out the travel movie we made. Enjoy!